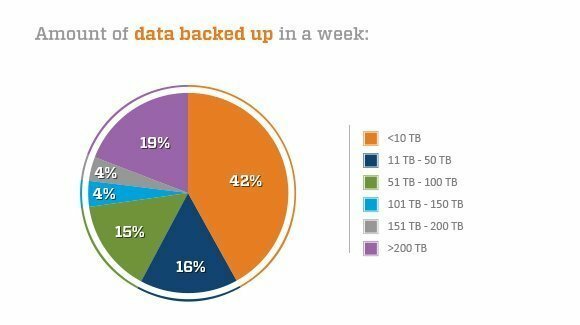 Exponential backup data growth isn't news; our readers have been adding disk capacity for backup data for years. Of the respondents to this Snapshot survey, 19% said that they are now backing up more than 200 TB of data a week. And, for the past two years, more than 45% of respondents to our Purchasing Intentions survey reported that spending on disk hardware for backup would increase. 1.) More organizations are performing disk-based backups, either having replaced or repurposed tape; for example, using disk for more frequently accessed data and tape for long-term retention and archive. 2.) Affordability of disk and increased reliability, performance and data footprint reduction (real-time compression, dedupe) are helping to support data protection. 3.) Organizations, particularly smaller ones that may not have been doing regular backups, are now doing so. 4.) Even though some are going to the cloud for backup, they continue to keep a local copy for fast restores. 5.) There is no such thing as a data or information recession. This has resulted in more data, particularly unstructured data, which needs to be backed up. Rachel Dines, analyst with Forrester Research, said that recent Forrester data* showed that "from 2010 to 2012, the average amount of data stored for server backups increased by 46%. A portion of this can be attributed to the data growth trend of digital and web content repositories (such as video, audio, images, and web pages), which grew 59% in the same period, and notoriously doesn't deduplicate well." "There is also the influence of overall increased data in the enterprise that needs to be backed up," she said. "Between 2010 and 2012, the average overall company data storage footprint grew by 60%. IT professionals most commonly blamed this on business growth and the fact that they are capturing more data per business activity than before." Dines also said that another factor contributing to the data growth trends is the tendency to retain backups for too long rather than deleting or archiving data.